Neuroimaging study identifies characteristic pattern of protein deposits in brains of retired athletes who suffered concussions. A new UCLA study takes another step toward the early understanding of a degenerative brain condition called chronic traumatic encephalopathy, or CTE, which affects athletes in contact sports who are exposed to repetitive brain injuries. Using a new imaging tool, researchers found a strikingly similar pattern of abnormal protein deposits in the brains of retired NFL players who suffered from concussions. The innovative imaging technique uses a chemical marker combined with positron emission tomography, or PET scan, and was initially tested in five retired NFL players and described in an article published in 2013. Now, building on their previous study, the UCLA researchers found the same characteristic pattern in a larger number of retired players who had sustained concussions. The current study also shows that the brain imaging pattern of people who have suffered concussions is markedly different from the scans of healthy people and from those with Alzheimer’s disease. Researchers say the findings could help lead to better identification of brain disorders in athletes and would allow doctors and scientists to test treatments that might help delay the progression of the disease before significant brain damage and symptoms emerge. The study is published in the Proceedings of the National Academy of Science. The team state that CTE is thought to cause memory loss, confusion, progressive dementia, depression, suicidal behaviour, personality changes and abnormal gaits and tremor, adding that currently, CTE can only be diagnosed definitively following autopsy. To help identify the disease, doctors look for an accumulation of a protein called tau in the regions of the brain that control mood, cognition and motor function. Tau is also one of the abnormal protein deposits found in the brains of people with Alzheimer’s, although in a distribution pattern that is different from that found in CTE. 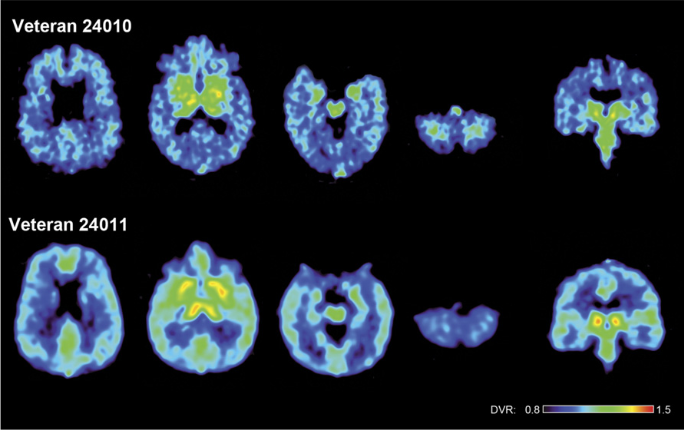 The previous study found that the distribution pattern of the abnormal brain proteins, primarily tau, observed in these PET scans, presents a ‘fingerprint’ characteristic of CTE. The team identified four stages of deposits that could signify early to advanced levels of CTE. The team explain that these different stages reflected by the brain marker may give the medical community more insight into how CTE develops and allow researchers to track the disease over time. The current study included 14 retired NFL players (including the five subjects from the earlier study), all of whom had sustained at least one concussion. Their results were compared with those of 19 men and nine women with healthy brains and 12 men and 12 women with Alzheimer’s disease of similar ages. Participants received a scan using the UCLA-developed technique, which previously was used for assessing neurological changes associated with Alzheimer’s disease. The test involves injecting a chemical marker called FDDNP, which binds to deposits of neurofibrillary tau tangles and amyloid beta plaques, the hallmarks of Alzheimer’s. Then, using PET scans, the researchers were able to pinpoint where in the brain these abnormal proteins accumulated. Participants also underwent MRI scans, neuropsychological testing, and neurological and physical exams to determine whether they had symptoms consistent with CTE, Alzheimer’s dementia or normal aging. The data findings showed that the imaging pattern in people with suspected CTE differs significantly from healthy volunteers and those with Alzheimer’s dementia. These results suggest that this brain scan may also be helpful as a test to differentiate trauma-related cognitive issues from those caused by Alzheimer’s disease. The PET scans revealed that the imaging patterns of the retired football players showed tau deposit patterns consistent with those that have been observed in autopsy studies of people with CTE. In addition, the areas in the brain where the patterns occurred were also consistent with the types of symptoms experienced by some of the study participants state the researchers. Compared with healthy people and those with Alzheimer’s, the former athletes had higher levels of FDDNP in the amygdala and subcortical regions of the brain, which are areas that control learning, memory, behaviour, emotions, and other mental and physical functions. People with Alzheimer’s, on the other hand, had higher levels of FDDNP in areas of the cerebral cortex that control memory, thinking, attention and other cognitive abilities. And the athletes who had experienced more concussions also had higher FDDNP levels according to the results. The team state that previous brain autopsy studies have shown that amyloid plaques are present in less than 45 percent of retired football players, most typically in those with advanced CTE. Most of the retired players in the new study did not have advanced CTE, which suggests that their FDDNP signal represents mostly tau deposits in the brain. The scans of people with the highest levels of FDDNP binding in areas where tau accumulates in CTE, also show binding in areas of the brain affected by amyloid plaques, which is consistent with autopsy findings indicating that this abnormal protein also plays a role in more serious cases of CTE. The team also reported initial results of scans of two military veterans. In the current study, the researchers note that the FDDNP PET scan is one of several methods , including blood-based biomarkers, diffusion tensor imaging MRI and resting state functional MRI, that are being studied by scientists across the country to help diagnose CTE early. The team surmise that the next stage of the research will include multi-site studies and will follow subjects over time to determine how effectively FDDNP can detect possible CTE and predict future symptoms. The researchers also plan to expand the studies to include other groups of people affected by brain injury, such as military personnel, adding that more expanded studies will help them better understand how different causes of head injury may contribute to chronic brain disorders. [F-18]FDDNP DVR parametric images of the brains of two war veterans with the history of multiple blast concussions (mTBIs) during their war zone deployment. The upper row shows a 48-y-old male (veteran 24010) and the lower row a 36-y-old male (veteran 24011). Left four images in each row show transaxial brain images from top of the brain to the bottom. The right image shows a coronal cut through the midbrain. Note different [F-18]FDDNP signal distribution from the patterns T1–T4 described for retired professional American football players and a pattern of lower signal in midbrain and amygdala. In vivo characterization of chronic traumatic encephalopathy using [F-18]FDDNP PET brain imaging. Barrio et al 2015.